Royal Enfield tricycle with electric motor. 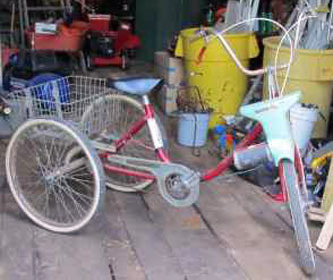 A Royal Enfield adult tricycle with an electric motor powering the front wheel is for sale on CraigsList in Danielsville, Pa. Although I've written about these Royal Enfield branded pedal-powered trikes before — some of them with gasoline engines — this is the first I've seen with electric power. "I purchased this item from a guy at work. He bought it at a yard sale. We aren't sure if the motor is original to the bike. It runs off a riding mower battery which sits in front of the basket on the back. It drives like a normal bike. You can push the one hand control and the battery moves the bike, the other hand control stops the bike. Electric motor powers front wheel. Pedals power the rear. "It has drum brakes on the front wheel. Basket on the back. It has a 12-volt Pedal Motor on front. 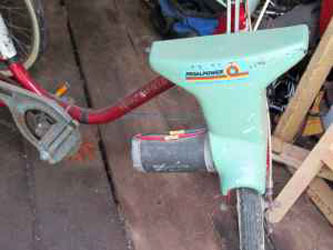 Manufactured by General Engines Co. Sewell N.J. Can be pedaled like a normal bike or use the motor. 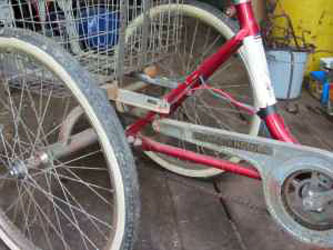 This is a bike that will need tires as they are worn. Motor does work. Asking price $200." This electric version is yet another variation in these machines, which come in many colors, with single and multiple-speed gearing and front drum or caliper brake. Common to all of them is the Royal Enfield name, although they were not built by Royal Enfield in Redditch, England or Chennai, India. Some are labelled "Made in Japan." Who builds these Royal Enfield tricycles? Common, too, is the curved, step-through frame, which must be immensely strong since it is unbraced. All seem to have the high-rise "ape hangar" handlebars and single solo seats. They come up for sale often on CraigsList in the U.S. There must be many of them out there. I'd like to know more about them and so would Terry, who says he welcomes input from anyone who knows more about his trike.